7 Blades: The 7 blade bent-grass mower is designed for low creeping, fine-bladed grass like Bermuda in the South, Southeast, and Southwest. This 7 blade push reel mower is similar to the reel mowers which are used by golf courses, but it does not cut finely enough to be used for cutting golf greens. Inspection: To assure a precise fine cut, all of these push reel mowers must pass inspection. They must cut paper which is 3000ths of an inch thick. This is much thinner than a blade of grass. Epic Mower: The new Epic Cordless Electric Mower uses a 24 volt system comprised of two 12 volt batteries. The Epic EP21H is a rotary mower, self-propelled and will run for approximately 45 minutes. This 30-year old program YouthBuild began when East Harlem youth were asked a question: what would you want to do if you had adult support? The answer: take back abandoned buildings from drug dealers, rebuild them, and give them to homeless families. Over 100 students and graduates from YouthBuild USA programs around the country showed off green building techniques on the Mall and, in a tent next to the building going up, took seminars about green building-related practices (event program (pdf)). In YouthBuild programs nationwide, low-income youth ages 16-24 work toward their GEDs or high school diplomas while learning job skills by building affordable housing for homeless and poor people. About 90 percent of YouthBuild students have quit high school, and 40 percent have been through the court system. Emphasizing leadership development and community service, YouthBuild creates a positive peer group to compete with the lure of the streets while developing new young leaders who have transcended poverty in America’s poorest communities. In 30 years, 84,000 students have built 18,000 units of affordable housing and have transformed their lives and communities. Easy, Odorless Worm Bins: Build or Buy? 1/3 of all methane emissions come from rotting organic matter in our landfills. Mother nature takes 500 to 1,000 years to produce one inch of topsoil or humus. Earthworms, under a stand of trees where leaves drop and animals stand for shade, can produce on inch of humus in five years! So no matter what you have to do to avoid throwing away organic matter…compost bins, wormeries, even buying your waste…let’s get everyone we can on board! This video below…is hilarious and shows you how you can have a worm bin for very little money. It’s not ideal…mostly because sorting out the worms with this type bin is a time consuming pain, but it’s better than nothing. Our favorite worm bins have stacks or trays so that as the organic matter gets digested, the worms just move up. Yes, there are a few worms who just don’t like to move up, and some lovely worm egg cocoons…but it is way more segregated and will save you hours to purchase a stack version for about $40 more dollars. The one we have in our basement this winter is the Can-O-Worms and it has handled the organic kitchen waste from a very vegetable-eating family of 4. And you can see…. our worms are really happy! So without further adieu…How to build your own worm bin, and why, from The Environmentalists! A customer just called and said that we were mentioned on page 32 of April’s “Food and Wine” issue. Evidently a previous customer bought a Sun-Mar 400 Continuous Compost Unit from us. The previous customer speaks highly of the experience with the unit. 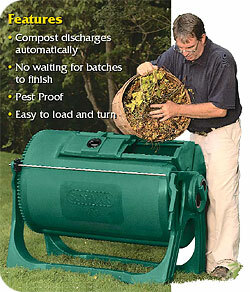 The Sun-Mar Continuous Compost maker is a large unit which has a 100 gallon capacity. It is excellent for kitchen scraps and cut-up material from the garden. It is 36″ high, 42″ long, 28″ deep and weighs 60 pounds. Reel Mower Historian: At the Turf Show I had the pleasure of meeting Jim Ricci who is an historian of reel mowers. At the show he had reel mowers from the UK, France, Germany, Denmark, the Netherlands and more. The reel mower from Germany is the Brill which Jim is standing next too. Collecting Publishings: Jim is looking to collect published pieces about reel mowers from around the globe and back in time. If anyone comes across this information please contact me. The new 2009 model of Sunlawn‘s Ideal reel lawn mower cuts from .5″ to 3″. The Ideal has larger improved wheels and its ten inch rubber wheels can now cut Bermuda. The Ideal is the new version of the LMM40 which we presently sell. The Ideal should be in stock in late April. Redesigned and re-engineered, the Sunlawn Ideal 40 reel mower has 10″ rubber wheels and cuts from .5″ to 3″.